Founded Febraury 25th, 2011 in response to the call for democracy in Libya, the New Libya Foundation serves to nurture democratic foundations through the building of Libyan civil society from the ground up. The most vital element of a new Libya is a society that is able to determine the course of its future, and contribute in setting the priorities of its governing body. No call to democratic governance can be realized until people organize to address their concerns and aspirations. The Libyan people have taken on the cause of building their nation and empowering citizens. The New Libya Foundation is working to provide the resources and means necessary to build the civic institutions of the new Libya and generations to come. 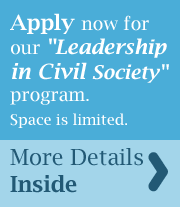 Nurture the successful development of civil society organizations in Libya through training, education, access to resources and financial assistance. Our vision is broad with our immediate focus on: Civic engagement, inclusiveness, and association. On Dec. 18th, 2013, leaders from across sectors (civil society, government, Media, Businessess, diplomats, INGOs) convened for the first civil society Networker, sponsored by USAID. The event theme was Fiscal transparency and accountability.